The most popular fishing streams in the Blackwell area are Pine Creek, Cedar Run (trophy trout regs), Slate Run (fly fishing only), and Stoney Fork, but there are also many native trout streams in the area. The formula for catching stocked trout is to fish any holes or deep riffles within 200 yards downstream of the bridges and access areas. As the water warms up the trout in Pine Creek move to areas with cold water flowing into the stream and fishing for bass and pan fish becomes more popular. 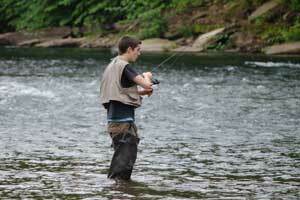 For more adventurous fisherman, there are excellent streams in the area for brook trout fishing. 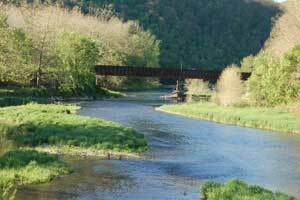 The Fish Commission can provide an extensive list of streams with wild trout reproduction. Generally, the further you hike from the nearest road, the larger and more aggressive the trout will be. Fishing for wild trout in remote areas can be as easy as making a quiet, downsteam approach to the pool and making a good first cast. Please limit your kills when fishing on these pristine streams, in order to maintain adequate populations for future reproduction. The Slate Run Tackle Shop is an excellent resource for fishing supplies and information on stream conditions and fly hatches.